In my last article I described four principles that Justin Roff-Marsh recommends we adopt to dramatically improve Sales productivity. Let’s look at how Roff-Marsh applies these principles to the sales function. Although this article only summarizes the application of these principles, you can find many more important details in Chapter 3 of Roff-Marsh’s book, The Machine. We’ll start with the traditional model where the salesperson does all the work. It’s just the Business Development Managers (BDM) working on their own. They do everything–prospecting, sales, administration, support, and solution design. This leaves them little time for meaningful sales interactions. The first principle tells us to divide the labor between the salesperson and someone to schedule the work. We’ll call this person a business development coordinator (BDC). The BDM no longer needs to schedule appointments with customers nor arrange internal meetings. 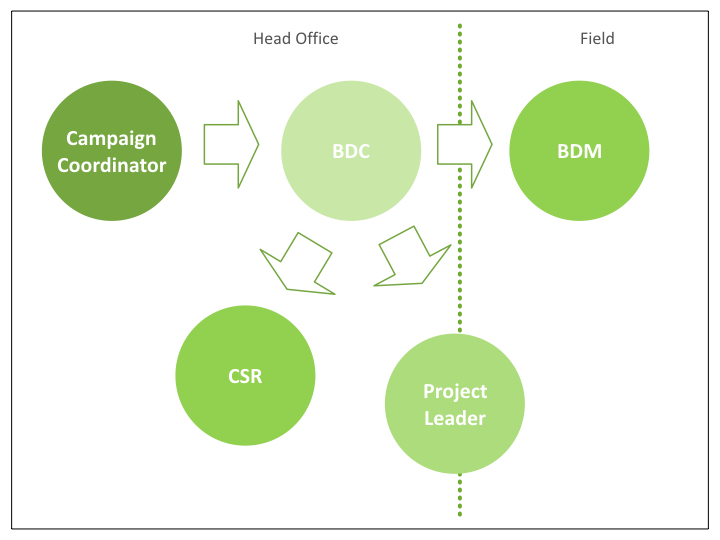 The BDC manages the schedule and pushes work to the BDM. Note that the Business Development Manager works in the field. This enables the BDM to spend more time directly with customers. It also saves the BDM from the difficulty of switching back and forth between field and office activities. 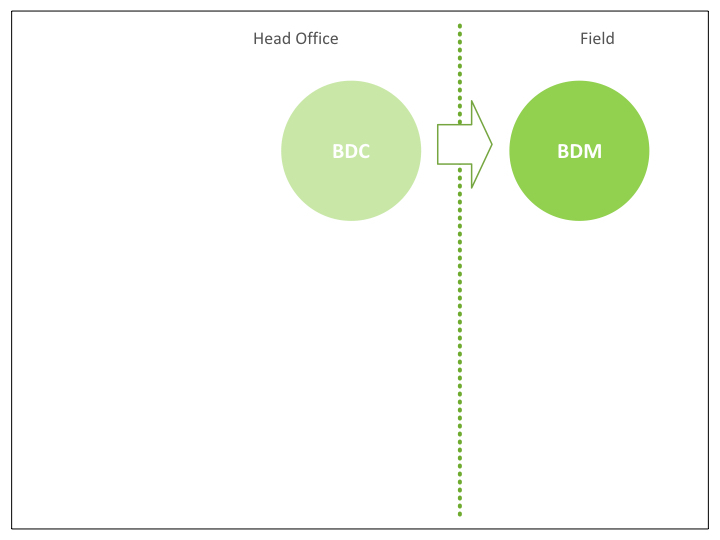 And conversely, the BDC works in the head office (not a regional office). The BDC is more able to coordinate with production and customer service when the BDC is located near them. It also helps the BDM to feel directly connected to the rest of the organization if the BDM’s scheduler is working in the head office close to everyone else. Now you might be thinking that Business Development Managers would find it awkward and demeaning for their work to be scheduled by a more junior BDC. Let’s frame it a different way. The BDC is more like valued executive assistants who support and protect their executives. The executive (and by analogy, the BDM) find their status elevated by working closely with a scheduler. The economics of this relationship are compelling. Roff-Marsh has found that a BDM and BDC working together can increase the BDM’s capacity to 20 meetings per week, a tenfold increase over a BDM working alone. That’s leverage! Before we consider other resources that could relieve BDMs from responsibilities that prevent them from more meaningful sales conversations, let’s look at principle number two and study how workflows could be standardized in sales. Then we’ll return to how we resource the workflows. 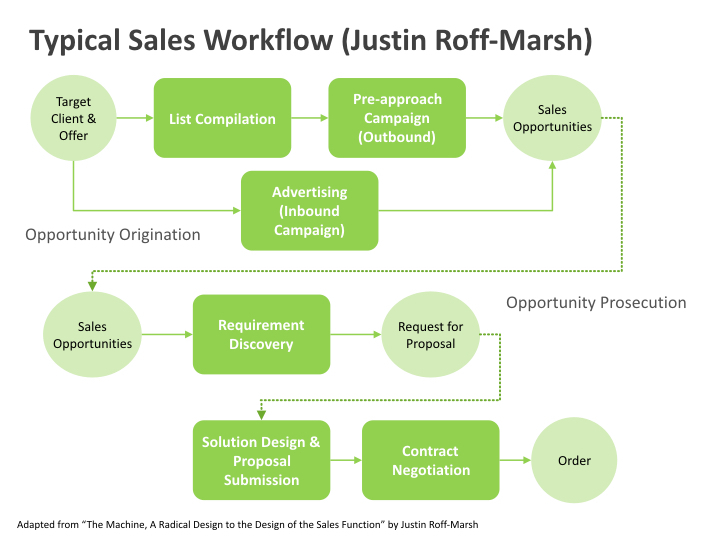 Roff-Marsh divides the sales workflow into two stages. In the first stage the work is about how we originate opportunities, in the second we prosecute those opportunities. In the the illustration below you can see the sequence of a typical sales workflow. Roff-Marsh separates these workflows because companies can originate opportunities in batches, but they must pursue them one at a time. Which raises the question, do salespeople need to follow a standard sequence of events when they pursue an opportunity? Do they have to follow the same workflow each time? Should all the salespeople in a department use the same workflow? Roff-Marsh suggests we look at the customer and ask this question: Does the customer follow a standard workflow when making a purchase? For small purchases, yes customers follow a standard workflow. And for large purchases, they may not follow a standard sequence simply because they make these purchases infrequently. But an optimum sequence probably exists and it will be to the seller and the customer’s benefit if we figure out what it is. So the answer is, yes, it’s to our benefit (and our customer’s) to adopt a standard workflow for the pursuit of opportunities. The point of a standard workflow is to enable your company to scale your sales function by dividing the labor of the BDM among multiple people. A standard workflow engineers complexity out of your system and makes it possible for people to hand off their work when they complete an activity in the workflow. 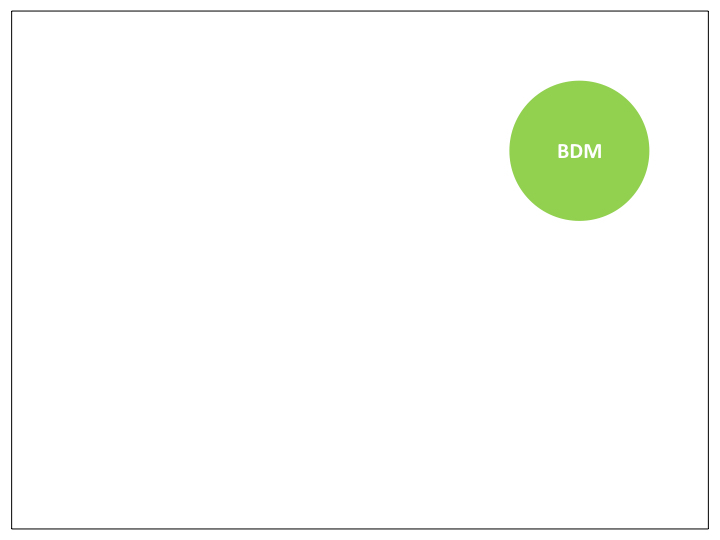 Now that we’ve established a standard workflow for the sales function, let’s return to the question of how to divide the labor of the BDM among different specialist resources. So far we’ve got a project manager (the BDC) and the BDM is doing everything else. So let’s see how Roff-Marsh assigns these activities to other people. Although salespeople could originate their own sales opportunities, it would be highly inefficient. Promotion includes building lists of contacts, developing compelling campaigns, and testing multiple campaign versions. These promotion activities are best done in batches. Therefore Roff-Marsh identifies a Campaign Coordinator as the next person to join the resource pool. 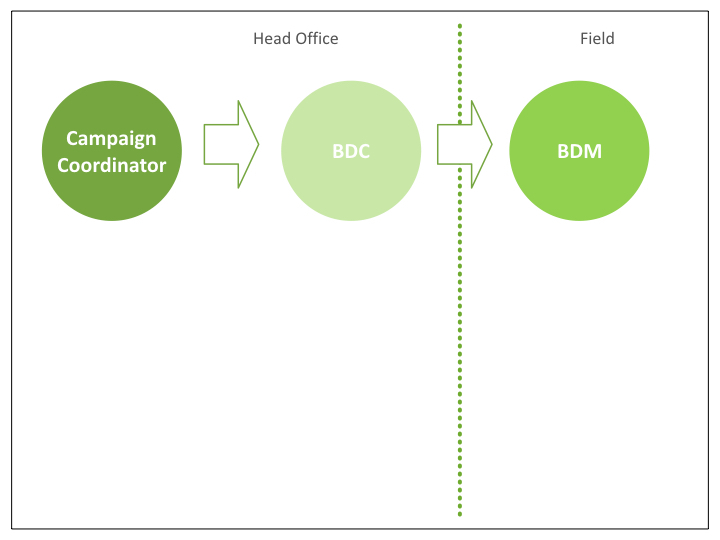 Although the campaign coordinator could live in marketing (where the campaigns originate), in practice it works best if the coordinator resides in sales. This enables this person to be in close contact with the conversations that the campaigns produce and to make adjustments to those campaigns. Few would argue that the BDM could transfer responsibility for many administrative tasks to the BDC—data entry, reporting, calendar management and travel planning. But, Roff-Marsh asks, “what about appointment setting and follow-up calls?” These calls are traditionally considered part of the salespersons purview and include a level of salesmanship that is beyond the ability of an administrator. Roff-Marsh explains that if the salesperson has sold the next meeting in the buying/selling sequence, then appointment setting simply becomes a scheduling task. Even the initial appointment-setting call is a scheduling exercise if the salesperson has effectively sold the initial meeting. Companies that sell engineer-to-order products encounter a common problem. Above a certain level of complexity, salespeople simply cannot extricate themselves from the handoff from sales to production. It becomes impossible to communicate everything production needs to know in order to complete a clean handoff. Roff-Marsh solves the problem by adding a third party to the mix, a project leader. 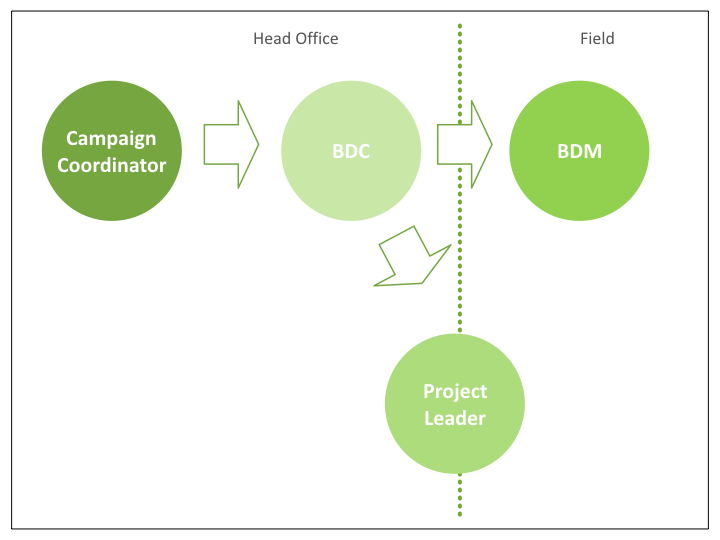 The project leader works closely with the BDM throughout the opportunity prosecution stage of the sales cycle. In particular, the project leader assumes responsibility for the requirement discovery and solution design stages of the sales workflow. The project leader becomes well-equipped to be the liaison between the customer and production which frees the BDM to move on to the next customer. In order for the customer service team to take responsibility for these activities (and relieve the BDM from the need to own them), two changes must be made. First, the customer service team must upgrade their skills so they can own customer service activities. And second, salespeople have to extricate themselves from immediately assuming responsibility for customer service issues when they arise. When you divide the labor of one person among multiple people, you create a system that is vulnerable to miscommunication, misunderstanding, and mistakes. The fourth principle from Roff-Marsh addresses this problem by requiring a formalization of management. Since many of the people in the newly organized sales function are more junior, it’s necessary to put in place a more senior person to manage issues and to make sure the relationships with production, marketing, and finance are working smoothly.